Now this is the third time I’ve displayed these spiders within three months – but this one was special, because it was also the first time I saw a male spider copulating a female. If you’ve read the previous Monsoon Trail articles, you probably know that if you see a female Two-tailed Spider, a male is almost always nearby. This time though, he was piggybacking her – a behaviour common throughout all spider families. Interestingly, they did not “unite” but he sure was trying to persuade her. After copulation, the female will lay several hundred eggs in a depression on the tree trunk, and spin the silk around it. She will sit by guarding the egg-case until the spiderlings hatch. As is apparent from its common name, they have rather long hind limbs, which are efficient at catching prey. Now most of the dragonflies have lengthened hind limbs, but I guess it is rather more apparent in this species, especially amongst Libellulids and hence the name. This glorious flower, commonly called Glory Lily, is superb in its morphology. The entire flower is up-side-down, with the petals, instead of pointing downwards; grow against the gravity, creating an illusion of flames. They almost resemble little lamps. Sadly, G. superba is endangered because it is gregariously harvested for its aesthetic looks and its medicinal values. It is very crucial to protect this fiery lily from being extinct, because its beauty has not only captured our imagination, but it is a valuable plant providing food to a number of insects. Some other findings were Aeginatia indica, a root parasite and Curcuma sp. Dinesh Valke did a fantastic job of documenting the flora on the trek. 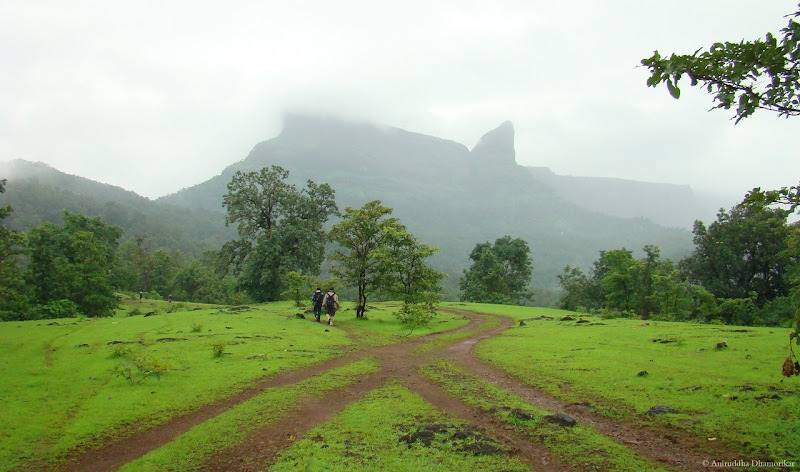 As we took the path that enters the foothills of Naneghat, we entered a dense ecosystem of the moist deciduous forests. These forests were strewn with a number of streams, and just as we treaded, our path merged with one of the streams – and we became lost. There’s a sense of adventure every time you take the wrong step. Now we weren’t far off the path, and therefore this excitement did not turn into a struggle for survival. I cherished walking in the cold stream surrounded by tall looming trees and with dragonflies everywhere I looked, some of them I’m yet to identify. As the Monsoon season wanes, the diversity of these Skippers (family Hesperiidae) increases. Golden Angle is a common skipper inhabiting forested patches, and they’re almost always found near a stream. After a small snack, we resumed our hike though the jungles. We reached a turning point where the path was heavily eroded, and from there it was a rocky climb straight up to the top. Strewn with large boulders, probably deliberately cut into steps to serve the purpose, it was hectic but a beautiful climb, with a view exceptionally serene. The Naneghat plateau and the thumb-like projection loomed directly over our heads. Our walk was slowed by intermittent pauses in the forest openings to check the view and get a clear glimpse of where we were headed. Treasure awaited us at the top, a treasure we were hoping to find. All along the trek, until we reached the very edge of the end of the climb, we were being stalked. It was a very swift stalker – bold and persistent. It was a Horsefly in the genus Philoliche. These large, robust blood-suckers were fairly common along the trek. They are easily identifiable by their large orange abdomen and a typically long mouthpart, shaped much like a sharp needle. Luckily, they do not use this “needle” to puncture you, because it is very elastic. Their real weapon lies much closer to their heads, a saw like two mandibles that they use to cut through flesh. The bites can be pretty painful, but fortunately none of us were bitten that day. Only the females require a bloody diet, since it is nutrient rich and helpful in the development of the young ones. Males primarily feed on nectar. On the way we saw some curious carvings over a fallen log. It looked as if someone intentionally carved butterflies on it. Interestingly, it was not the artwork of any man, but a small beetle, more specifically a Wood-boring beetle. The beetle lays eggs in the visible median line when the bark of the tree is intact. The grubs, when they hatch, travel outwards like protruding arms, eating their way until they transform into a pupa. And when the bark of the tree is stripped, this pattern is revealed. Clutched into the shoulder of the broad plateau that stretched far and wide in the opposite directions, this passage was used not only by humans, but by a number of butterflies! I recorded Glassy Tiger, an unidentified Oak Blue, a Common Emigrant, and a Blue Mormon that passed right through this pass into the valley down below. Batches of Barn Swallows were also seen sweeping in into the pass. While I’m not sure if the butterflies got sucked in, into this narrow slope, I’m sure it was not just a pass meant for business, but it was a corridor for animals as well. It is a Dung Beetle, and there were at least ten of them on a small pile. All they were doing is making a perfect roll of the dung and carrying it away in order to lay an egg. Since there were so many, it must have been a fierce competition, and Dung Beetles are well known to compete and steal other’s dung balls. I hope everyone got at least one from what was left of that poop, rather, a resource. It also shows how important they are to clean up the grasslands. ﻿From the plateau, we could see the Jivdhan fort as well as a long spine, called Khadaparshi looming over Naneghat. It was almost out of JRR Tolkien’s Middle Earth – and I’m not the only one to say this. Khadaparshi looks like a large figure of a king, much like that of the Numenor Kings statues! After spending the time absorbing the beauty of this place, we started treading back, and heard a loud thundering of falling rocks. A small ledge on a nearby slope had given away. It was a landslide. Fortunately, it did not do any damage to human life. It is a Tick. Ticks are arachnids, known to live solely on the diet of blood. They are notorious little creatures that can cause huge loss to cattle herders, if they swarm. Luckily, Ticks are not much of a problem in this part of the Western Ghats, but those who have been bitten think otherwise. Although Ticks here are not known to spread any diseases, if you’re allergic to their bites, the itch takes years to fade away. By then, you may have developed a phobia of these little buggers, as I did. It was an excellent trek through a variety of habitats, from little grasslands to streams, to the dense and humid deciduous forests, and the plateau of Sahyadris. Naneghat is also excellent in terms of its biodiversity, harbouring a rich diversity of flora and fauna. What’s inevitable is the mark that we humans leave behind. Like every place on Earth, Naneghat is also infected with plastic crap in nooks and corners. I strongly recommend visiting Naneghat if you’re fond of roughing it up and exploring the amazing diversity it has to offer. My oh my, you had a marvelous adventure. The pictures are beautiful. I felt as if you had taken me with you. Fantastic photos as always Ani! The lone tree on the side of the hill and the land crab surrounded by water are stunning!